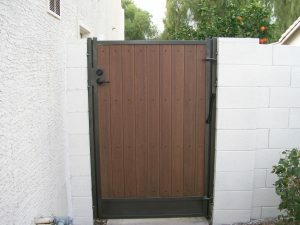 DCS Industries manufactures several different series of gates to safeguard residential and commercial properties, regardless of the property’s unique style or the owner’s budget. Gates in our Elite Series are an excellent option for numerous types of properties, offering an ideal blend of elegance and simplicity at a cost-effective price. Elite Series gates feature premium-grade composite redwood or rustic cedar enclosed by a wrought iron frame. There are no wrought iron pickets between the slats of wood, creating a sleek, “elite” appearance that will enhance the curb appeal of any property. Frames are available in a variety of colors and finishes, from white to rust to glossy or textured black. As with all wrought iron products from DCS Industries, the frames on Elite Series gates may be galvanized, which refers to the process of adding a protective zinc coating. Our galvanized wrought iron products carry a ten-year warranty against rust, ensuring that your investment will yield value for years to come. 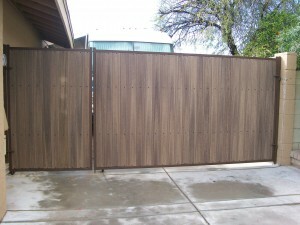 The primary function of any gate is to create privacy, safety, and control over who accesses the property. The composite wood in Elite Series gates has a seamless look that maximizes privacy. To provide optimal security, Elite Series gates may be outfitted with a variety of latching mechanisms, from a gravity latch to a double lock box. Upon installation, the DCS Industries team will ensure that these mechanisms are functioning properly and that the gate matches the style of the property. Regardless of the series, all gates from DCS Industries are made with only the highest-quality hardware and accessories, and all are custom designed, manufactured, and installed by our team of professionals. We have over a decade of experience in creating the right fencing and gate solutions for a variety of commercial, residential, and industrial properties. Call us today at 623-825-7700 to learn more about the Elite Series or request a free estimate!